The site previously known as Queen Elizabeth II Park (QEII) was home to the QEII sport and recreation facility and constructed for the 1974 Commonwealth Games. The facility closed in 2010 due to significant earthquake damage and was demolished. 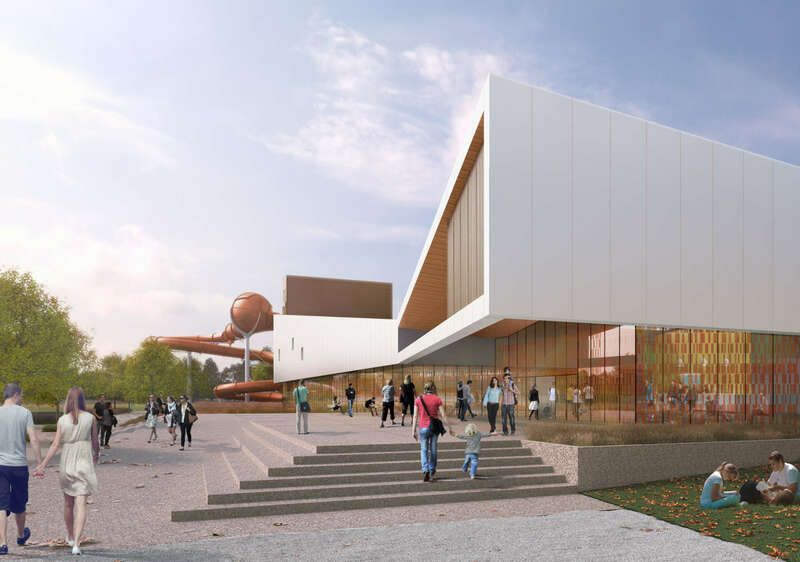 Christchurch City Council contracted RDT Pacific as Project Managers and Apollo Projects as the contractor to build the new $38.6 million centre to replace some of the aquatic and fitness facilities lost when the earthquake-damaged QEII Centre was demolished. The result is a 5500 square metre facility was designed with input from the community and includes a 130-metre long hydroslide, a 25-metre lap pool, a leisure pool with lazy river channel and water toys, a learn-to-swim pool, a hydrotherapy pool, a spa, sauna, and steam room. It also has a fitness centre with a spin studio and group fitness area, a café, meeting rooms, and enough parking for 200 vehicles and 160 bikes. The 10-lane pool has a moveable floor, a first for Christchurch. It provides enhanced programming opportunities for the pools, meaning more can be done simultaneously in the pool. The moveable floor will cover half the pool so deepwater activity can happen on one side and shallower activities such as aqua fitness or swimming lessons can happen on the other. As the area suffered major liquefaction in the quakes, an innovative approach to needed to be taken towards the materials selected for the new pools. Natare Stainless Steel was selected to wall the pools. This technology is more seismic friendly and allows the pools to be re-levelled up to 50mm in the event of future earthquakes. The project was procured through a Design and Build tender process based on a comprehensive set of client requirements which included performance specifications and a fully developed preliminary design. All design consultants involved in the preparation of the Design and Build tender documents were retained for observation and review through the design and construction phases which ensured the quality aspects of the project were maintained throughout the entire project. RDT Pacific managed the complete process from concept planning, which included extensive community and Iwi consultation, through to the Design and Build tender and finally construction. Conscious how important the project was to the community, RDT Pacific were thorough throughout the community and Iwi consultation to ensure all voices and user groups were heard. The multimillion-dollar Taiora QEII Recreation and Sport Centre was officially opened on Queens Birthday weekend – ahead of schedule and under budget. It was exciting to see the centre hit maximum capacity, with an estimated more than 14,000 people through the door already, clearly exhibiting the community interest for this project. RDT Pacific are extremely proud to have contributed to such an exciting project for the Canterbury region. “The opening of this wonderful new centre represents a major milestone in eastern Christchurch’s post-earthquake recovery,’’ says Mayor Lianne Dalziel. “For the first time since the earthquakes, people living in the east have aquatic facilities they can be proud of. They have a place where their kids can learn to swim and where they can have fun with their friends and family. “It is a really positive step forward and I’m thrilled to have had the honour of opening the new centre,’’ the Mayor says.